Trevor Algatt, here — I’m one of the L.A.-based VO2GoGo instructors. The world is noisier than ever. News, email, mobile notifications, the siren call of social media… There are no limits to the demands on our attention, and giving in to these demands often means missing out on doing meaningful, productive, profitable work—especially as home-based VO artists. Here’s an app that can help keep you on task. It’s called Forest. It’s available both as an iOS and Android app (for $1.99), and there’s also a Chrome browser extension (free). Whether you’re plowing through a series of auditions (making bolder choices faster), or working through a list of updates to your various profiles and your Featured Talent Listing page, Forest can help. 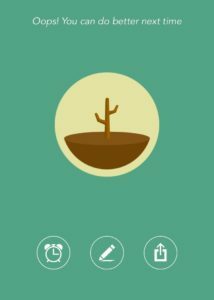 Open the app, set a timer for how long you’d like to focus (read: not be on your phone), and “plant a tree” for between 10 and 120 minutes. Here’s the fun part: if you leave the app (to send a text, or check Instagram, or do anything else on your smartphone), the tree dies. 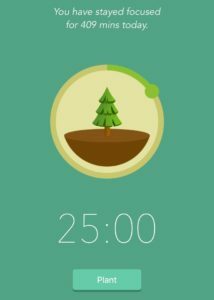 Since I’m not the tree-killing type, I’ve found this kind of thing to be exactly the fun little incentive I need to practice building more focused work sessions into my day. The Chrome browser extension (for your computer) works in a similar way, but instead of encouraging you to not use your phone, it encourages you to not visit websites. Once you install the extension, you can specify your forbidden sites (e.g. Twitter, Facebook, Pinterest, CNN, TMZ.com—you know your what your vices are), and then plant your tree. It’s possible, of course, to leave the app or visit any website while your tree is growing; Forest never locks you out of doing anything. It just offers a cute little nudge—a reminder to stay on task until it’s time for a break. There are a lot of other apps out there with a similar function: AntiSocial, Freedom, and SelfControl are just a few. But I like Forest: I’m a sucker for gamification, tracking, and cute graphics. Which apps have you found useful, if any, to help you buckle down and get some focused work in? And what’s been your experience with them? Let us know in the comments below.